Claimed to be the most efficient power supply available today, the MAX20049 is a power management IC (PMIC) for vehicle camera modules that has been released by Maxim Integrated. 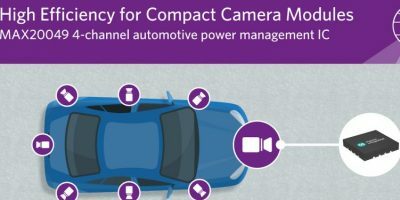 It has been introduced to meet the demands of automotive camera modules which are becoming increasingly smaller. The MAX20049 integrates four power supplies into a small footprint. The MAX20049 offers options to support various output voltages while also providing fault mitigation by flagging faults and shifts in output voltages. The four-channel MAX20049 measures 38mm2 and is almost 30 per cent more compact than competitive solutions, claims Maxim Integrated and offer the highest efficiency among other quad-power power management ICs in its class. It has options to support modules that need various output voltages for different mixes of sensors and serialisers, enabling designers to make changes in layout or to fine-tune the IC to meet specific application requirements. Flexible sequencing and fixed output voltages support various image sensors. The MAX20049 provides fault mitigation to help flag faults and shifts in output voltages to ensure that the cameras are working as needed. It has over-voltage protection, under-voltage lockout, external power good (PGOOD) signal and cycle-by-cycle current limit. And supports a wide voltage input range from 4.0 to 17V, enabling power-over-coax (POC), typically from 8.0 to 10V. There is also an option of using one of the buck converters as an intermediate supply for generating typical sensor and serialiser rails. System efficiency at full load is 74 per cent, compared with 69 per cent efficiency for discrete ICs. Spread spectrum and 2.2MHz switching frequency mitigates electromagnetic interference (EMI) to meet CISPR low-noise specifications. The MAX20049 is available now and Maxim also offers the MAX20049EVKIT# evaluation kit and EE-Sim models.